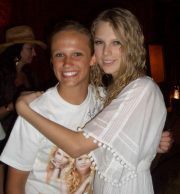 She loves country music and is a big fan of Taylor Swift, she even got to meet her at a concert. I think she may have a little crush on him. It's OK McKenzie, I have not checked your room, but I would not be surprised if you had a life size poster of him on your wall. I mean I had one of Patrick Swayze when I was in High School, maybe I should not have divulged that information. 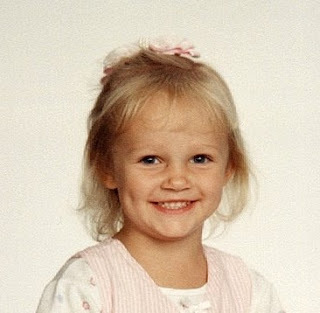 I don't have a specific memory to share of McKenzie, but I will share what I love about her. I love that she is so friendly and nice to everyone. I love that when she makes a commitment to something, she keeps it. I love that she claims she does not like any particular boy right now, and is going to win the $500 her Dad promises to give for not kissing until she is 18. (I wonder if she made it) I love her right dimple. I love that she wants me to do her makeup for Prom, and lets me give her eyebrows and put lip gloss on her. And I love her cute little raspy voice. 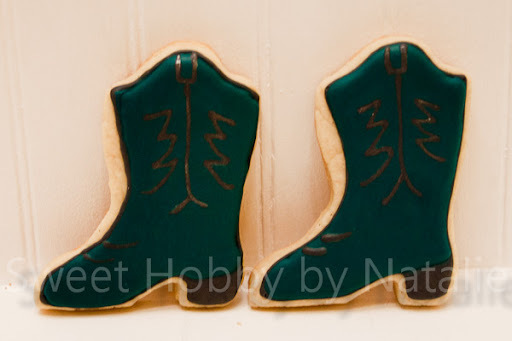 She loves country music and loves country style, so I thought I would make her some cowboy boots. I am not sure if she likes this color, I know her favorite color is caribbean blue, but I mixed this color out of an existing blue I had which was too dark, and I couldn't get it to lighten up so she is getting a deep teal instead! She loves the movie Hot Rod. My sister, her mom, said it was a really stupid movie, but McKenzie likes to quote it all the time. Well I thought I would Netflix and check it out. I made it through about 15 minutes of it, and was not into it. 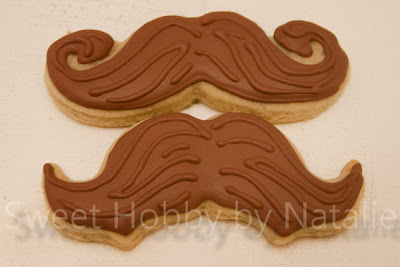 Sorry Kenz, I guess the main character wants to be a stunt man, and when he gets on his bike he pastes on a mustache, so hence she got a couple of mustache cookies. 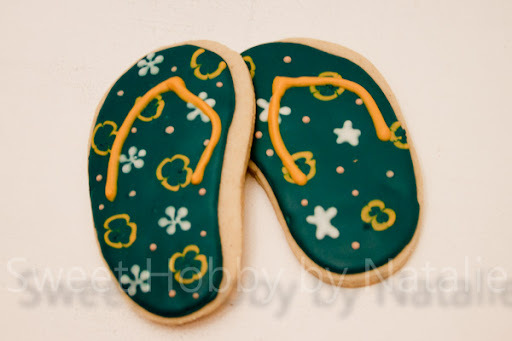 McKenzie loves Hawaii and loves all things beach, so flip flops are a perfect fit. 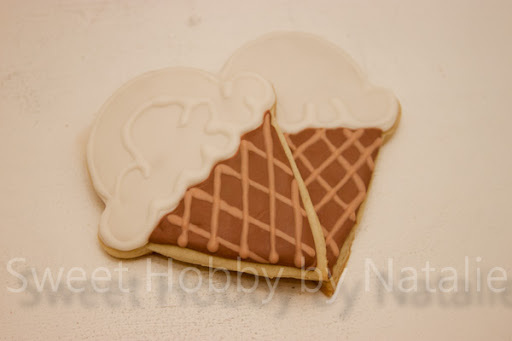 She said she loves ice cream, all kinds, so I did a couple of ice cream cone cookies. I don't have a ice cream cone cookie cutter, so I used a circle cutter and party hat cutter to make the shape I needed. 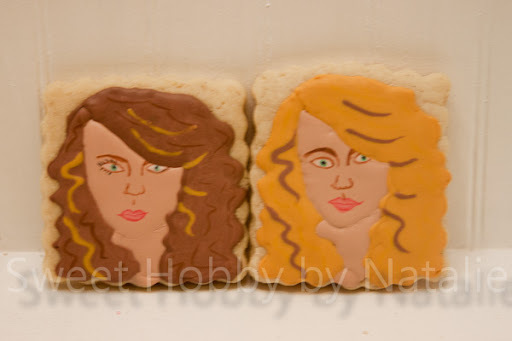 Here is my lame attempt of making Taylor Swift cookies. I think the blonde version looks more like Miley Cyrus than Taylor! They turned out so cute! She loves them and shows them off to her friends. We weren't sure what the mustaches were for but now we know! Great write up too! Those ones are super cute! You always do such a good job Natalie!! Finally just caught up on the blog!! 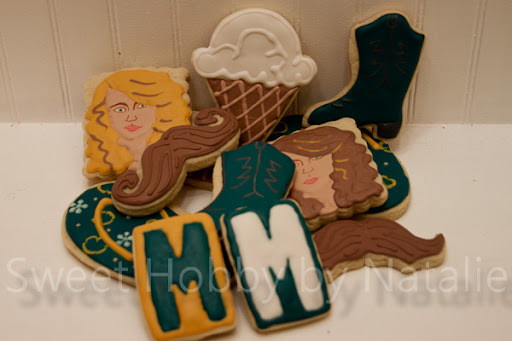 LOVE all these cookies designs!! The running shoes for Amanda were one of my favs and also the flip flop and the ice cream cones for kenzie. You are amazing! !